The outdoor motocross nationals are right around the corner. There are less than 50 days before some of the best motocross racers in the world compete for all the glory of a National Motocross Championship. The speed, grit, and intensity of outdoor motocross are second to none and something you need to check out as the series comes with a couple of hours drive from New Jersey four times in 2018. Events in Mt Morris, Pennsylvania, Southwick, Massachusetts, New Berlin New York and Mechanicsville, Maryland are all a quick weekend trip. The outdoor nationals are also where you’ll get the opportunity to see local New Jersey pros in action against the best in the world. Mark your calendars for some great racing action. MORGANTOWN, W. Va. (April 2, 2018) – With less than 50 days until the first gate drop of the 2018 season, MX Sports Pro Racing has announced that $6.5 million in prize money and contingency will be on the line for the world’s fastest racers in this summer’s Lucas Oil Pro Motocross Championship, sanctioned by AMA Pro Racing. Thanks to the incredible support of the six competing manufacturers, the combined total of OEM contingency and pro purse results in a record sum of prize money for the world’s most prestigious off-road motorcycle racing championship. 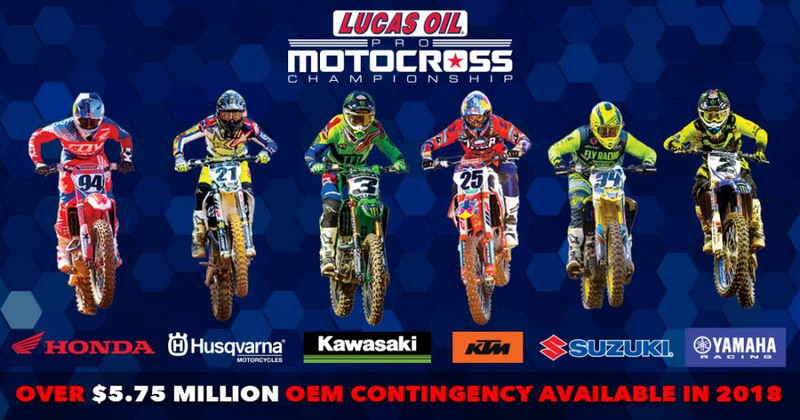 Anchored by the factory and factory-supported efforts of Honda, Husqvarna, Kawasaki, KTM, Suzuki, and Yamaha, the 40-rider fields in both the 450 Class and 250 Class will compete for a share of $5.79 million in OEM contingency. Additionally, nearly $1 million in pro purse money will be available. Defending 450 Class Champion Eli Tomac (Monster Energy Kawasaki) and his title-holding 250 Class counterpart Zach Osborne (Rockstar Energy Husqvarna Factory Racing) will lead the most talented riders on the planet into action on Saturday, May 19, with the Hangtown Motocross Classic. A total of 12 championship rounds will visit the most legendary and iconic racetracks in the country, visiting a total of 11 states on the path to crown a pair of champions at the Ironman National on Saturday, August 25. May 26 Glen Helen National San Bernardino, Calif.
June 23 Tennessee National Blountville, Tenn.
July 7 RedBud National Buchanan, Mich.
July 21 Spring Creek National Millville, Minn.
August 11 Unadilla National New Berlin, N.Y.